The late Thomas P. (Tip) O’Neill, Jr., former Speaker of the House, once said, “All politics is local.” From campaigning for election to signing a bill into law, the most informed decisions are made when local voices are taken into consideration. The same could be said of real estate. Take a moment to really think about this statement. Sure, real estate spans the globe and analyzing the data from broad markets allows us to see overarching trends, but the most valuable real estate information exists at the local level. When making the decision to rent or buy, local market data provides the most accurate and relevant information needed to understand your options and what’s best for you and your business. But finding this information isn’t as easy as you might imagine. Often real estate market data comes in the form of various graphs and tables that, while they offer valuable information, don’t often break the data down to the most local level. Omni Realty is the only Commercial Real Estate Broker that offers local market data on all commercial real estate investment classes: Industrial; Office; and Retail. Every quarter, we take the lastest market reports and break them down into local summaries that we share on our blog each month, highlighting the most interesting and important trends. Sure we’re passionate about real estate, but the real reason we take the time to provide these market reports is for our clients. Real estate decisions can be stressful and confusing, but when equipped with knowledge, you can gain a sense of control and confidence. Here’s how we do it. In analyzing metropolitan areas, we use geographic designations to help group properties together, called Markets, Submarket Clusters and Submarkets. Markets are the equivalent of metropolitan areas (or areas containing a large population nucleus) that, together with adjacent communities, have a high degree of economic and social integration. Markets are then divided into Submarket Clusters. These are core areas within a metropolitan area that are known to be competitive with each other in terms of attracting and keeping tenants. Submarket Clusters are further subdivided into smaller units called simply Submarkets, which serve to delineate a core group of buildings that are competitive with each other and constitute a generally accepted competitive set, or peer group. You can see how this very specific data might be hard to track down and analyze – which is why many of the large market reports only go as local as the “Philadelphia Market.” This is a huge territory that includes everything from urban to rural submarkets. This broad data is less than helpful when making a local renting or buying decision here in Central Pennsylvania. So for the benefit of our clients, we break down the data to make it more relevant. And based on our expertise, we also offer insight on the trends and what they mean for you. President of Omni Realty, Mike Kushner has been actively involved in the local commercial real estate market for over 28 years as an investor, developer, broker and manager. Nearly three decades of working in this industry provides Mike with a specific and unique expertise in local commercial real estate. And he is passionate about sharing this knowledge with the community. Check back each month or subscribe to our blog in the top corner of this page for Omni’s local market reports and other insights into local commercial real estate. This month, we’ve featured several companies and organizations who are giving back for the holidays and all year round. It’s easy to see that Central PA is filled with groups and companies willing to lend a hand. The PinnacleHealth Foundation recently launched the PinnacleHealth Children’s Fund to support numerous programs for children in our hospitals and community. With a gift of $25, $50, $100 or more, you can help provide medical screenings for abused children, cover a portion of a child’s hospital bill, or support childhood obesity prevention programs. Children’s & Teen Center – At the Children’s and Teen Center, children and adolescents from birth to age 18 receive quality healthcare regardless of their ability to pay. Children’s Resource Center (CRC) – The CRC is dedicated to helping infants and children under the age of 18 recover from abuse so that they may develop and grow into healthy, productive, and non-violent adults. Childhood Lead Poising Prevention Center – PinnacleHealth’s Childhood Lead Poising Prevention Program provides comprehensive lead poisoning prevention, testing and control services. Bereavement Programs for Children – Camp Dragonfly is a free weekend bereavement camp for children ages 6-12. Together Laughing and Crying is a six-week spring and fall support group for children ages 6-12 who have lost a parent or other family member to illness, accident, suicide or homicide. Infant Development Program – Early intervention helps children born with a diagnosed disability or medical condition reach their fullest potential. Wellness and Prevention Programs – Girls on the Run is a life-changing learning program for girls ages 8-13. The program combines training for a 3.1-mile running event with self-esteem enhancing, uplifting workouts. KidShape is a nine-week fun-filled program that helps overweight children and their families become healthier. KidSahpe teaches the entire family how to eat more nutritiously, make exercise a fun part of their daily routine, form new healthy habits, and like themselves regardless of size. The Children’s Fund will maintain and improve the health and quality of life for all children of Central Pennsylvania through PinnacleHealth programs or services. Click here to make a donation or to learn more. Last week, we talked about how some local businesses are giving back to the community. This week, we’ll discuss another local opportunity for giving: The Bethesda Mission’s Medical/Dental Clinic program. Bethesda is raising money to build a new Medical/Dental clinic as part of its “Rescue. Redeem. Restore. $2.9M Capital Campaign.” With a $600,000 price tag, the 3,000 square foot clinic will have five exam rooms and two dental chairs according to current plans. This space will be an addition to their current location at 611 Reilly Street. Bethesda has raised $400,000 and is soliciting the remaining $200,000, hoping to begin construction in the summer of 2012. For two decades the Bethesda Mission has treated those who are uninsured or underinsured. Doctors and medical students from the Hershey Medical Center volunteer to work at the clinic, which is also staffed by Bethesda’s nurses. In 2010, the clinic’s staff handled 3,000 patient visits. Just over a year ago, the mission opened a dental clinic that is open every Friday and provides care to 100-150 people each year. Currently, modular units are being utilized for the medical clinic while the dental clinic is utilizing dormitory space on the second floor of the men’s shelter. The plans for the new medical/dental facility will move the clinics to the south side of the men’s shelter. 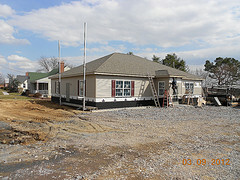 You can help make this facility come to life by making a pledge or cash donation toward this new and improved clinic. Three-to-five-year pledges are encouraged. You can also help by referring Bethesda to other potential funding sources. Omni Realty Group is excited to get involved. Will you join me in supporting this great local cause?